Purple houseplants make gorgeous and fun additions to any plant collection, and they can really live up your home! 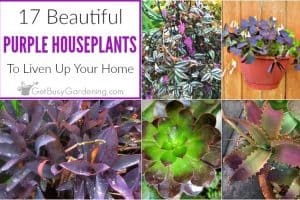 In this post, I share my top choices for the best purple indoor plants, as well as care tips to help keep them looking their best. Wait, what? Purple houseplants? Sounds like something out of a Dr. Seuss book doesn’t it? Well, I’m hear to tell you that such a thing does exist! Oh, and I’m not talking about plants with purple flowers here! 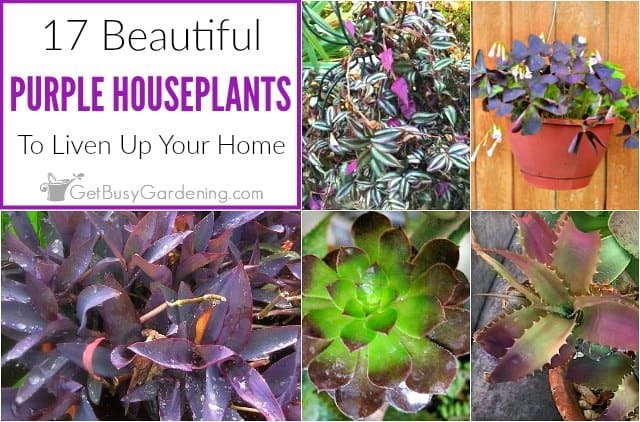 These are all houseplants with purple leaves, or purple and green leaves. And they’re all fabulous! 1. Purple Queen (Tradescantia pallida; aka purple heart houseplant) – One of my favorite (and very purple) houseplants. Purple queen is easy to grow indoors, and gets tiny heart shaped flowers during the summer. Be sure to give it plenty of light indoors or the color will fade, and the plant will grow leggy. 2. Pilea – There are lots of varieties of pilea plants out there, and they come in a wide range of colors. Some of them have purple splashes, splotches or edges on their leaves. While others have purple leaves with silver or green. A spot with bright, indirect sunlight and lots of humidity would be ideal. 3. 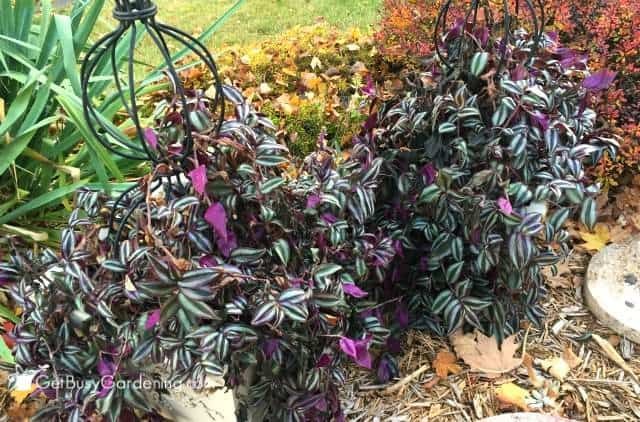 Wandering Jew (Tradescantia zebrina; aka: purple zebrina) – A super common plant that’s easy to propagate and looks great in a hanging basket, or trained to grow on a topiary form. The purple and silver/green leaves are stunning. Learn how to care for wandering jew plants here. 4. Purple Velvet (Gynura aurantiaca) – Also known as the purple passion plant, this gorgeous and unique indoor plant has furry leaves and yellow flowers. Place it near a sunny window, and water it regularly for best results. 5. Prayer Plant – Another unique beauty that comes in many varieties, including some that have purple stems or veins. The leaves open during the day and close at night, resembling prayer hands. They are low light plants, but an indirect bright light location is ideal. 6. 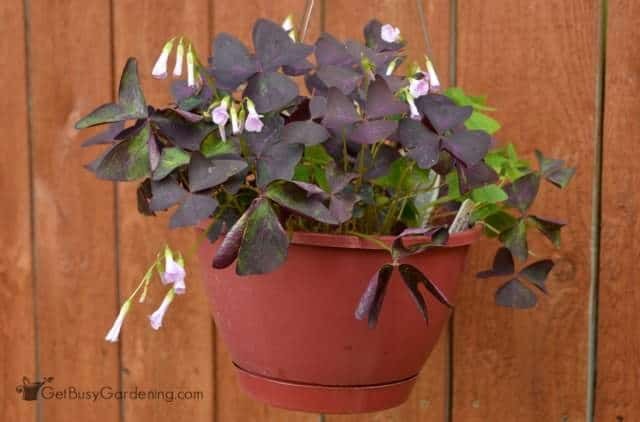 Purple Oxalis – There are a couple different types of oxalis that would make an excellent purple leaf houseplant. 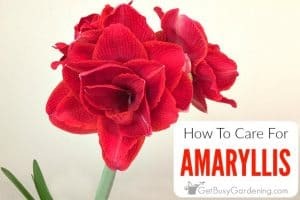 It’s a cute little plant that flowers during the summer, and looks great in hanging baskets. Keep it out of direct sunlight, and don’t overwater it. 7. Purple Waffle Plant (Hemigraphis colorata) – Another fun little purple indoor plant. The leaves are crinkled, which is where it get it’s name. It likes a lot of water, so never let this one dry out, and be sure to give it plenty of humidity too. 8. Polka dot plant – This adorable purple and green plant can be found in a few different colors. It’s usually sold as an annual plant during the spring and summer, but can be grown as a houseplant too. Be sure it give it as much light as possible indoors. 9. African Milk Bush (Euphorbia bicompacta var. rubra) – I love this one for its glossy purple leaves (plus it looks great in my family room next to my purple ottoman!). Be sure to give it plenty of light so it won’t grow leggy, and keep the soil on the dry side. 10. Calathea – There are a lot of different varieties of calathea out there, so be sure to look for the purple and green houseplant variety. They make gorgeous low light indoor plants! Be sure to keep the soil moist, and never let it dry out completely. 11. Rex Begonia – Rex begonias are so stinkin’ pretty, and there are tons of purple leaf varieties to choose from. It’s common to find them sold as annuals in the spring, but they make excellent indoor plants. Read about how to care for begonia houseplants here. 12. Succulents – There are many different types of succulents, and even some cactus plants that are purple or purple-ish. Plus, they are super fun to collect and grow indoors. Just be sure to give them plenty of light, and never overwater them. 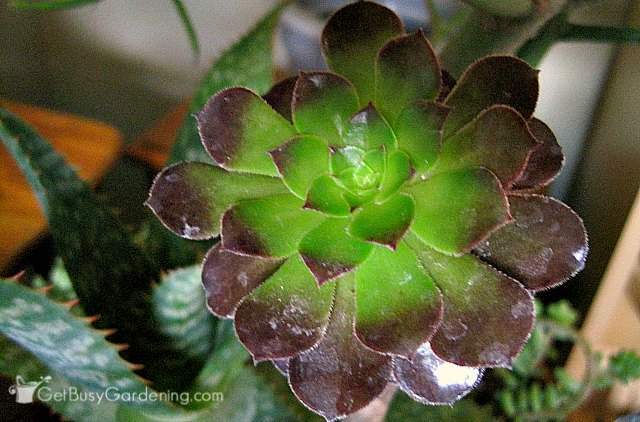 Read all about succulent plant care here. 13. 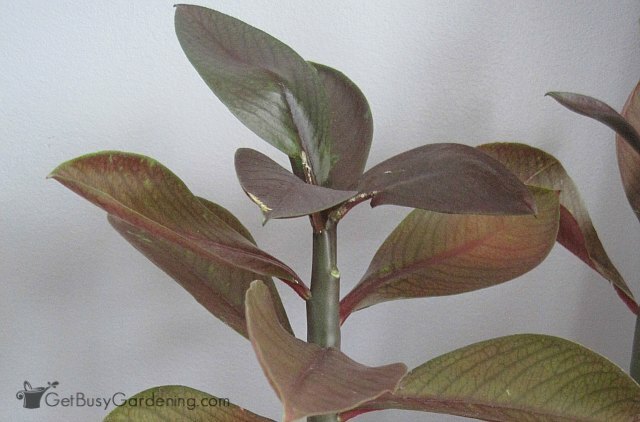 Rubber Tree ‘Burgundy’ (Ficus elastica) – Another wonderful indoor plant with purple leaves. The new leaves are bright red when they’re opening, which makes a striking contrast against the mature burgundy leaves. Give it plenty of light, and allow the soil to dry out between waterings. 14. 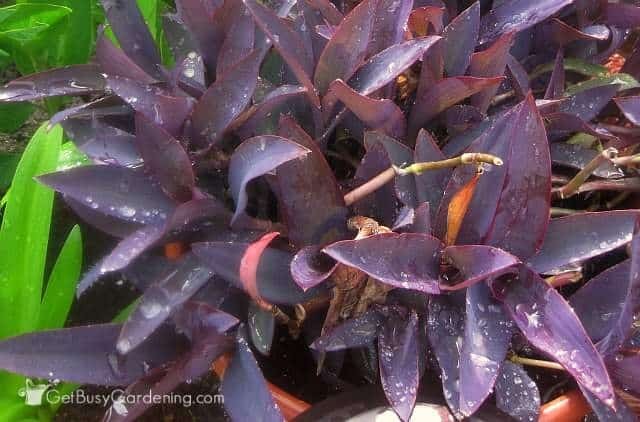 Ti Plant (Cordyline fruticosa) – This one comes in a few different colors, so be sure to look for the houseplant with purple leaves rather than the red or orange ones. But what the heck, go ahead, collect them all! Give it plenty of sunlight indoors, and don’t overwater. 15. Silver Squill (Ledebouria socialis) – A cute little houseplant with green leaves and a purple underside. The tops of the leaves are silver polka dotted, and the stems are purple too. Give it plenty of light, and it will flower in the spring. Just don’t overwater it or the bulbs could rot. 16. Purple sweet potato vine – Usually grown as an annual plant for summer containers, sweet potato vine can be brought inside in the fall and grown as a houseplant. There are a couple of beautiful purple varieties to look for too. Learn how to overwinter sweet potato vines here. 17. Coleus – Also usually sold as an annual for the garden, coleus is fairly easy to grow as a houseplant. There are tons of shades of purple leaf coleus plants on the market too, so you can collect them all. Learn how to overwinter coleus indoors here. 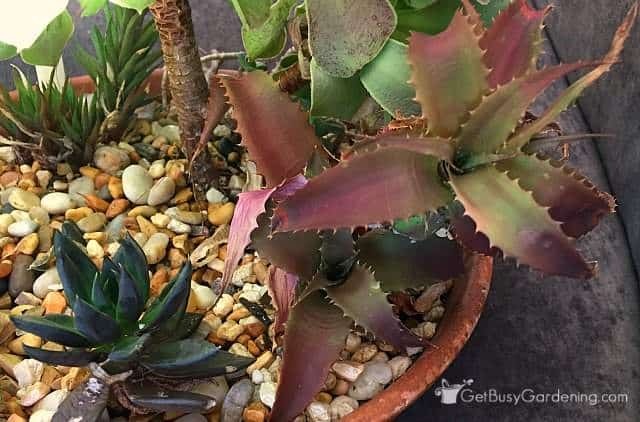 Light – Most purple leaved houseplants will require bright light in order to keep their color and their compact, bushy shape. A south facing window would be the perfect spot for them, or you can add a grow light and set it on an outlet timer. Water – Since these purple beauties are more exotic than common houseplants, many of them will have special watering requirements. You can use a houseplant water meter to make sure you’re not over or under watering. 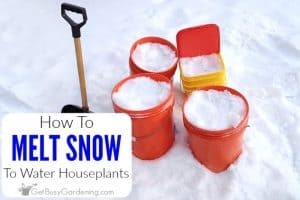 Some of them will also benefit from added humidity (running a humidifier near your plants will help a ton during the winter). 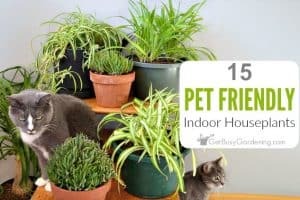 Fertilizer – Your houseplants will benefit from being fed during the spring and summer months, and I recommend using an organic indoor plant food. Compost tea is also a wonderful all-purpose fertilizer that works great. You can buy it in a liquid concentrate, or get compost tea bags to brew your own. You should be able to find some common houseplants purple leaves for sale at your local garden center year round. But many of these purple houseplants are also sold as annual bedding plants, or in mixed containers during the spring and summer. So, be sure to check there for more options. Of course, you can always buy purple indoor plants online anytime. How’s that for a list of AH-mazing houseplants? If you had all these purple indoor plants, your friends would be in awe (they would be purple with envy, haha). I mean, you would totally be the talk of the town! Ok, well maybe nobody else will really care, but YOU will know how cool you are, right?! If you struggle to grow healthy indoor plants year round, then my Winter Houseplant Care eBook is for you! 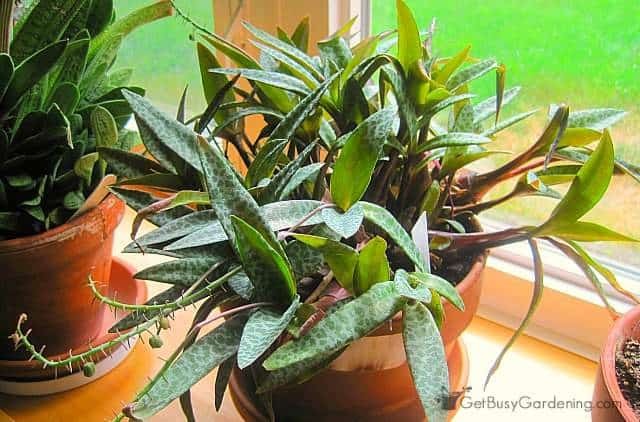 It will teach you everything you need to know about keeping your houseplants alive and thriving all year long. Download your copy today! 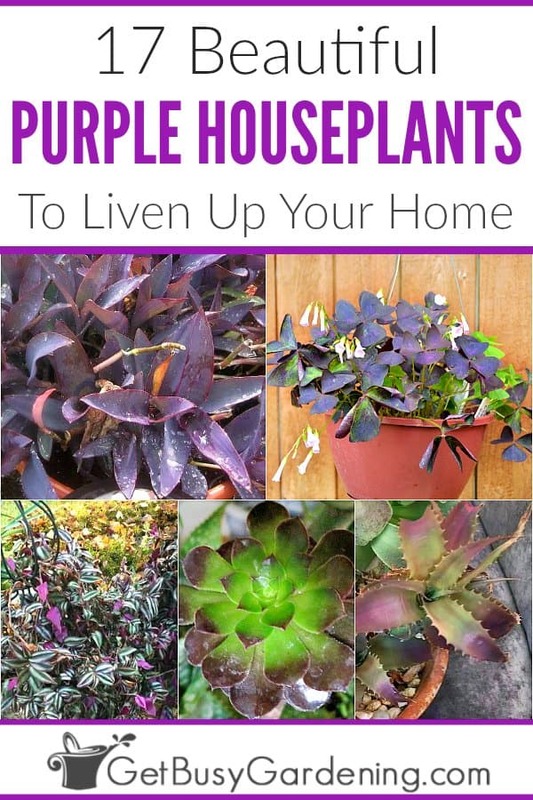 Share your favorite purple houseplants that you would add to this list in the comments section below. Purple houseplants have always been my favorite. I haven’t seen the Purple Queen for many many years. I ‘ve also heard it called Purple Heart. Anything in the Wandering Jew Plant family has always been pretty much foolproof for me and it suits an impatient gardener on a budget. Does anyone know where I might find this plant? Thanks. Thank you. I’ll do that. Nuver thought of looking in mixed containers. If I buy one I know I can quickly get more because they grow fast and root easily in water. Thanks again. I was at home depot. Inside where they kept the cactus plants I found some wandering jew in hanging baskets. Several small sprigs had fell on the floor so I ask if I could have them since they were on the floor. So I brought it home and now it’s growing great for free. I even clip more pieces off and put in water to have more. I have it in the same pot with purple passion and another purple plant. They all grow well together.My purple passion also grows long and I cut it and make new starts in water then after rooting I replant. Quiet the deal for picking up small pieces on the floor and growing them beautiful. I have about 3 acres of walkways and gardens so I’m needing something with color needing shade. What do you call the plant that’s featured on your blog here? I’ve had one, grows like crazy and gets cute little pink flowers. Humm… I’m not exactly sure which plant you’re asking about, but I think you mean the Purple Queen plant.